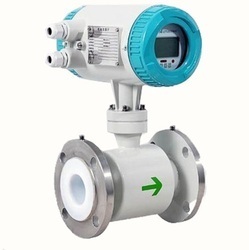 Leading Manufacturer of electromagnetic flow meter from Chennai. Line Size (inch) 1" to 18"
The Electromagnetic Flow Meter accurately measures the flow rate of any conducting liquid or slurry that is flowing in closed pipes. It is obstruction less and hence offers no pressure drop in the process. The absence of moving parts ensures that there is no need for maintenance. The performance of the instrument is not affected by the properties of the material such as corrosives, viscosity, density, acidity, and alkalinity. It can measure the flow of liquids, pastes, and slurries in water, waste water, chemical, fertilizers, paper, dairy, sugar, food and beverage industries. IP 68 protection available for sensors. Usable with corrosive and abrasive liquids and slurries. Display of flow rate and totalized value in multiple units. Looking for “Electromagnetic Flow Meter”?